Just as soon as spring approached, we began contemplating what to plant in our summer garden. The consensus was that we wanted plenty of homemade tomato sauce all winter long, coming from fresh, organic produce. After renting out our community garden from our local park district, we made calculations and designs for our 20 x 20 plot (which was actually a bit larger once we saw it). We planted 25 tomato plants, 20 basil plants, 2 thyme, 2 oregano, 1 marjoram and 2 globe basil plants. Needless to say, we’ve been making a lot of pesto, tomato sauce and numerous other things that can be made with these vegetables and herbs. I thought I could share with you a step-by-step process I take to easily remove the skins from my tomatoes. Once the tomatoes are peeled, you can then decide what you want to do with the tomatoes. Some options include: 1) freezing the tomatoes whole; 2) jarring or canning the tomatoes whole; 3) chopping and making a sauce, salsa or curry. I’m sure you have other ideas, as well. Please leave your ideas or suggestions in the comments box. I’d also like to know if this step-by-step illustration was helpful to you. Step 2) Bring a large dutch oven (or two, if you have a lot of tomatoes) to a rolling boil, which means you should see the bubbles rolling around in the water in a continuous boil. It’s a good idea to start the water while you core the tomatoes. Step 3) Add the cored tomatoes to the dutch oven. In about 2-3 minutes, the tomato skins should begin to crack. Remove as soon as the skin cracks, as you don’t want to cook the tomato. Step 4) Here you can see what the tomatoes look like once they begin to crack (click photo to enlarge). You will be able to see the pink flesh of the tomato. Step 5) Be sure your ice bath bowl is large enough to fit as many tomatoes as you are cooking in your dutch oven. Begin preparing the ice bath as soon as you drop the tomatoes into the pot of boiling water. I like to use large ice bags for this project, as it is quicker to refill than using small ice cube trays. If you have an ice machine on your refrigerator, that should work just as well. Step 6) Add the cracked tomatoes to the ice bath and let sit until cool, about 1-2 minutes, but not much longer. You will know when each one is ready to be removed when it no longer feels warm to the touch. 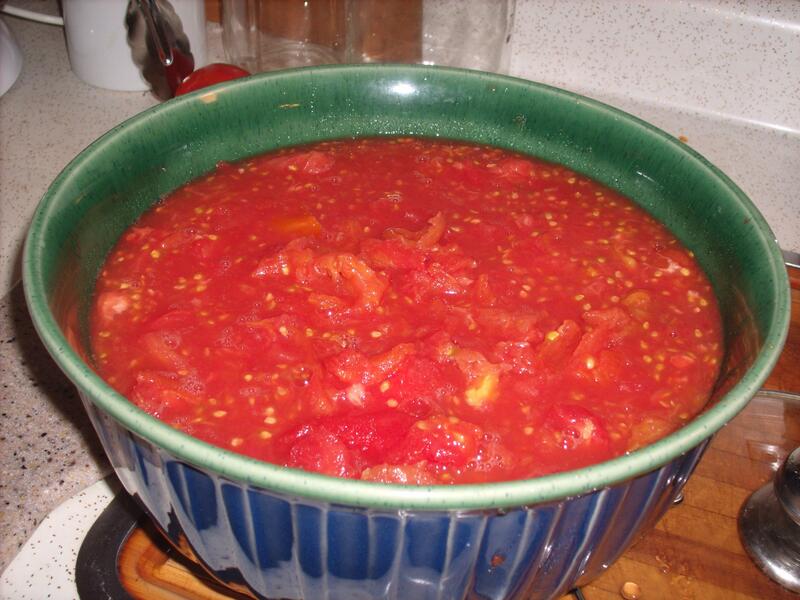 Step 7) Proceed to move the tomatoes to a colander or strainer, as some juices and water may flow out. As you will see in the last photo (crushed tomatoes), I decided to crush the tomatoes with a potato masher in order to make a chunky tomato sauce. You could opt to skip this step and simply freeze the peeled tomatoes as is until you are ready to decide what you want to use them for. In my case, I sauteeed onions and garlic in olive oil and added this beautiful sauce to the pan. I simmered for several hours while in between I added freeze-dried basil, dried thyme and oregano, a dash of cinnamon and sugar and a pinch of salt. The sauce keeps for several days in the fridge. I used it the next day on angel hair pasta mixed in with ground turkey. Yummy!